As a Christ-centered environment, students are encouraged to be responsible and contributing members of society and the local community. As part of this preparation for a life of worth and not merely a life of work, students in Year 5 form a Justice Squad. This is a social justice group that gives back to those in need in the community. The Justice Squad coordinates visits to local Aged Care facilities, Winter and Christmas Appeals, as well as promoting community health and wellbeing programs. 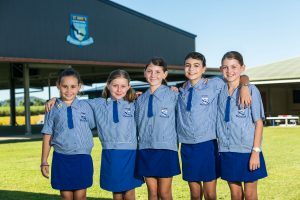 “One of my greatest joys of becoming a member of the St John’s School community comes from watching the children grow through the numerous, academic, social and emotional development opportunities available. They also learn about the benefit and joy of giving to others and become involved with community service activities.